Shopping for fall and school can become an expensive undertaking, since you have to purchase back-to-school supplies, backpacks, electronics, clothing and many other things within short time frame. Weather usually turns quickly once September comes and if you live in colder climate, she may also need a winter coat or boots. I understand this since I’m also a parent and always dressed my daughter in boutique clothing. I decided to write this short article, to give you some ideas about how to shop on a budget and not to go broke by mixing-and-matching several items to create a wardrobe for fall and winter this season. Many times, we base our buying decision on price and not on the functionality of item or it’s usefulness. I’m just a s guilty of this myself. So many times, I would go in the store and see something affordable and cute and I would buy it. Then I would come home and realize that I have absolutely nothing in my wardrobe that would look good with this. Which means that I would need to spend more money to make an outfit. I still make this mistake, but I’ve learned over the years, that it’s better to buy less and maybe at higher price than having full closet off mismatched things. So we would like to show you some of the items from our Fall 2018 Collection that would mix and match well and are absolute must haves. 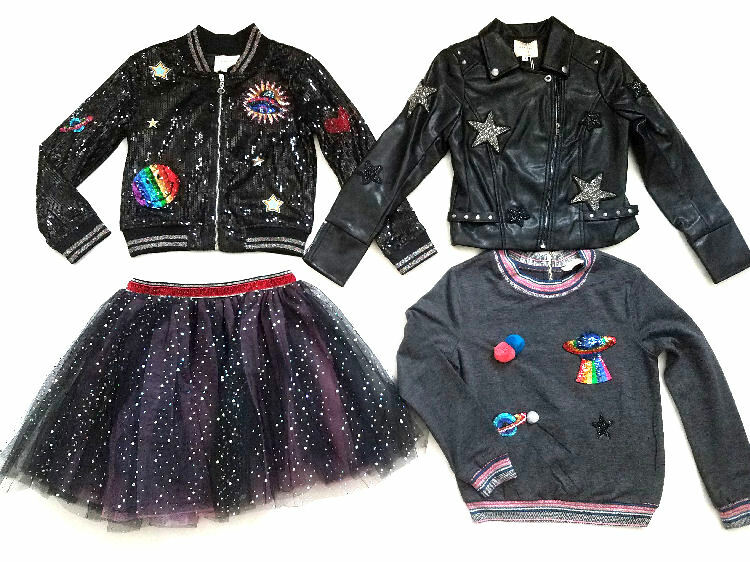 This first grouping shows 4 items from Hannah Banana that all mix and match together, depending on the age and the look you are trying to achieve, this Sparkly Hannah Banana Tulle Skirt looks great with all other 3 pieces and makes 3 different outfits. let’s expand little more, let’s add another grouping and see what else can be added to expand the wardrobe. 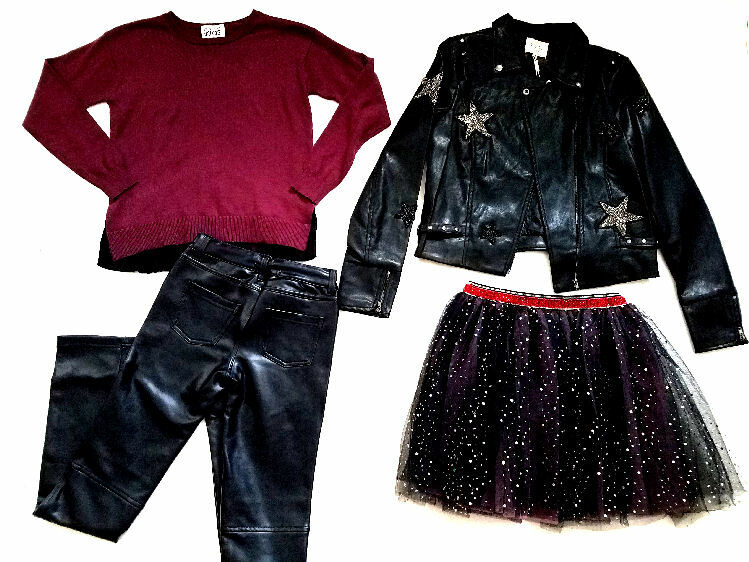 Ok, so we add 2 more items, Autumn Cashmere Sweater w/Black Pleated Back and Ragdoll & Rockets Black Faux leather Pants. 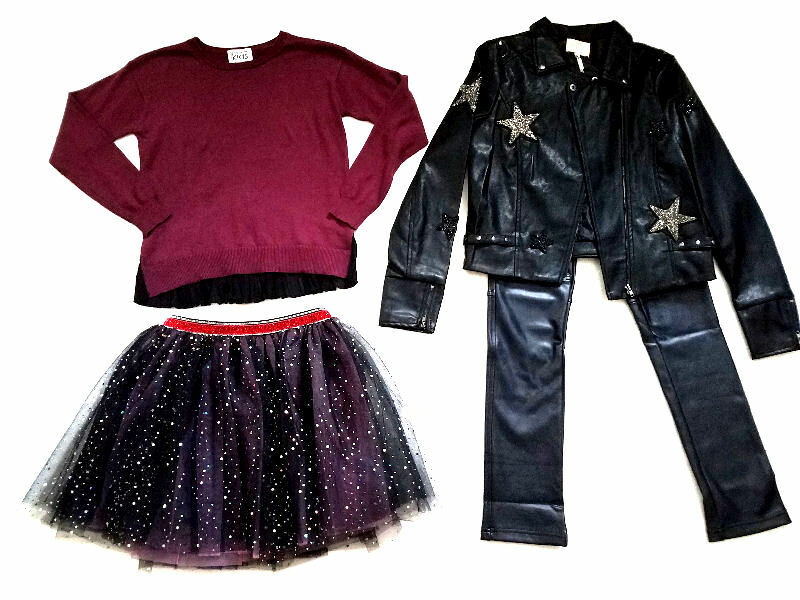 Both of these mix and match perfectly with all 4 items from previous grouping, especially with the skirt and leather jacket. 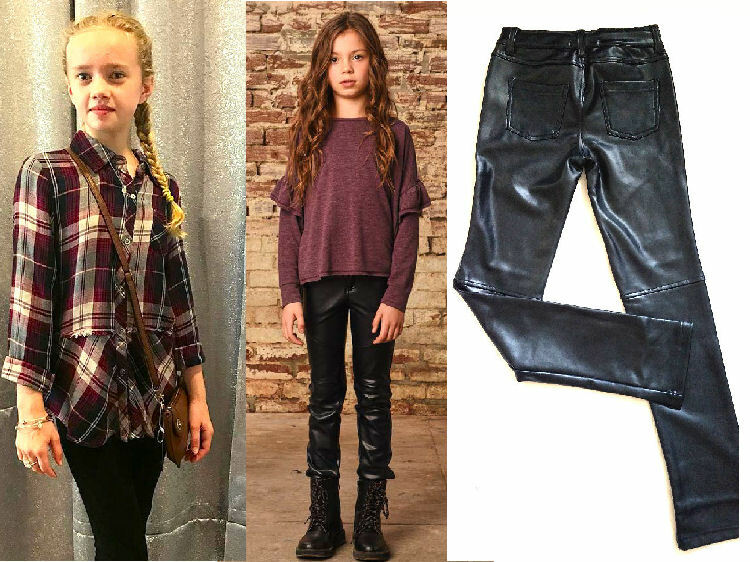 The leather pants and not just your regular pants, they are super nice with soft suede on the inside and are perfect for winter. We could keep going and keep adding more, but I think you got our point. These 9 pieces will look great together and give unlimited outfit options, especially if you give it a little bit more thought and incorporate this into her existing closet. Stay tuned, we’ll be back with another post about mixing and matching!